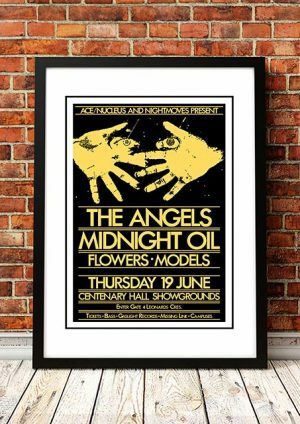 Classic Models Band Concert Posters and Memorabilia! Buy Online Now! Models were one of the pioneers of post-punk and new wave in Australia. 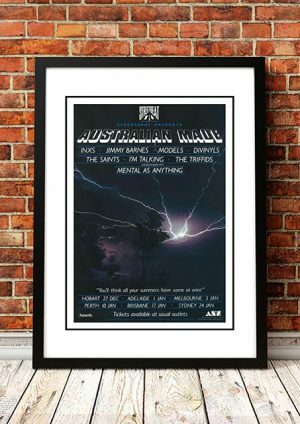 Although the band never achieved the international recognition of compatriots such as INXS and Midnight Oil, they reaped several chart hits in their native land. Models formed in Melbourne, Australia, in 1978. The original lineup consisted of Sean Kelly (vocals, guitar), Pierre Voltaire (bass), Ash Wednesday (synthesizer), and Janis Friedenfelds (drums). Voltaire was eventually replaced by Mark Ferrie; in 1979, Wednesday left the group, and Andrew Duffield became the new keyboardist. By 1980, the band’s live gigs produced a buzz in the music industry; Models were subsequently signed to Mushroom Records that year, releasing their debut LP Alphabravocharliedeltaechofoxtrotgolf. In 1981, Models became an opening act for the Police. Their performances led to an international distribution deal with A&M Records. However, the group was unable to sustain a consistent membership. Models lost Friedenfelds in 1981 and replaced him with Buster Stiggs. A year later, Stiggs and Ferrie split, and Graham Scott (drums), John Rowell (guitar), and James Freud (bass) were hired to fill the void. Models started to alter their sound as well, becoming more danceable. Models were rewarded with their first big hit, “Barbados,” in 1985; it reached number two on the Australian pop charts. The band’s next single, “Out of Mind Out of Sight,” skyrocketed to the top; it even landed at number 36 in America. The group recorded one more album, 1986’s Models’ Media, before disbanding in 1988. In 1990, Kelly and Duffield formed the short-lived Absent Friends, followed by the Dukes. We stock some awesome Models Band Concert Posters.